Don't know what to do this holiday? Don't know what to do this weekend? Then why not head down to the International Balloon Fiesta 2015 which is being held in Bristol. This weekend sees the return of the 37th annual Bristol International Balloon Fiesta, which is a spectacular, free four day event running from Thursday 6th - Sunday 9th August. 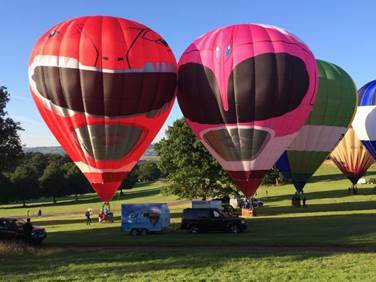 This year the Balloon Fiesta will not only feature one but TWO Mighty Morphin Power Ranger hot air balloons, they have been designed to replicate the the iconic Pink and Red Power Rangers Helmets. As well as Power Rangers hot air balloons, on the ground all five Mighty Morphin Power Rangers will be there for a meet and greet with the fans and they will be giving away some exciting merchandise too, so whether your a Mighty Morphin Power Rangers fan, a hot air balloon enthusiast or your just looking for something awesome to do this weekend why not head on down to the Bristol International Balloon Fiesta and have a awesome weekend. In the mean time why not take part in my competition I've got a fabulous Mighty Morphin Power Rangers bundle up for grabs including Power Rangers Megazord and Costumes.